On the 11th of December 2018, the National Assembly of Cameroon passed a Finance Law for 2019 that included provisions for taxing digital applications produced outside the customs territory. A tax of CFAF 200 per application would be applicable. The new law doesn’t include any mechanism for enforcement, so it is not clear how the CFAF 200 would be collected or who would collect the tax. Aside from the enforcement issues, an end-user tax such as this is universally recognized as bad practice because it distorts competition (it is only applicable to some firms); it suppresses demand for a service that has positive externalities (the benefits of the telecom sector are more widespread, the more people that are online) and could have negative consequences for the economy. However, it is true that off-shore firms are able to avoid taxes such as a general sales tax, including in the digital sector. This means that consumers pay lower prices for products from off-shore digital firms. To remedy this problem, in March 2018, the OECD released its Interim Report on Tax Challenges Arising from Digitalisation listing best practices for taxing the digital sector. In the report, the OECD recommends that non-resident taxpayers register and pay in each jurisdiction in which they are liable for the tax. This best practice approach is often not practical. As KPMG says in a review of the OECD report, this approach is not always realistic in areas outside of the EU because the off-shore firm would face compliance obligations in multiple new jurisdictions, the need to appoint fiscal representatives, open local bank accounts, manage currency controls as well as the fact that there is no international uniformity in terms of VAT collection processes. 1) The Internet was was shut down for 230 days in the period between January 2017 March 2018 in two anglophone regions in Cameroon that affected about one-third of the population and specifically the tech ecosystem in Buea, known as Silicon Mountain. 3) SIM registration regulations impacting on subscriber numbers. 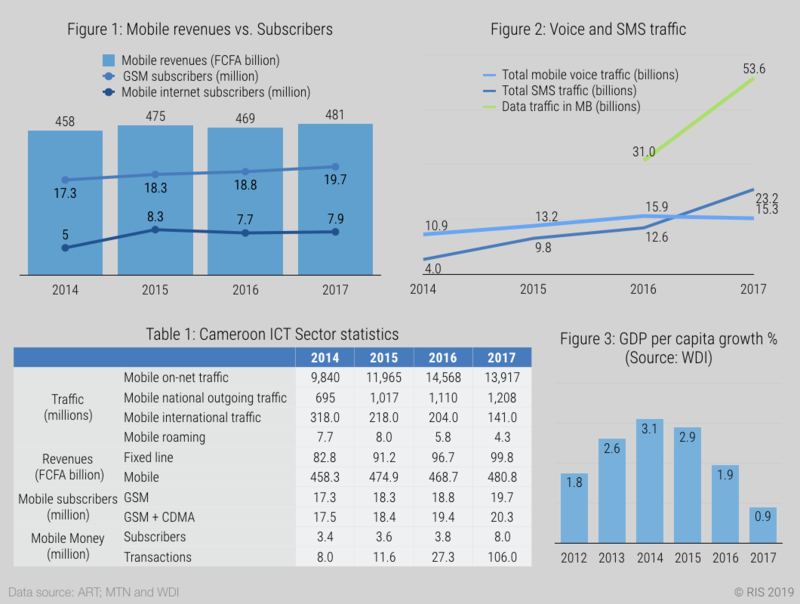 ICT sector revenues dropped as a result of the Internet shut down as well as the impact of the SIM card registration process. Revenues have been increasing since then. The internet shut down may have also caused a slow down of mobile internet adoption. 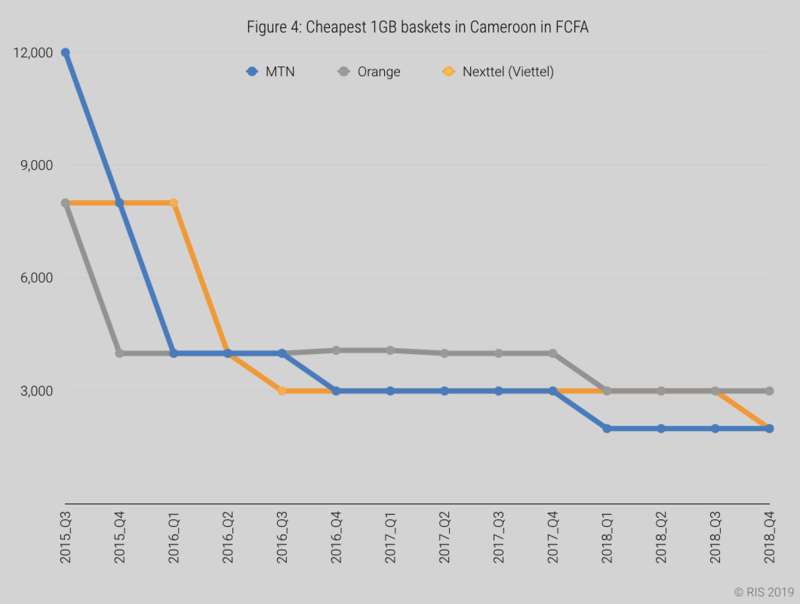 MTN’s revenues have steadily declined, while Orange’s revenues have been fairly constant.The decline in MTN subscriber numbers (Figure 5) is due to the market entry of Nexttel (owned by the Vietnamese company Viettel) in September 2014, which competed on price (Figure 4) and gained significant market share since then. Orange managed to defend its market share. The new tax on mobile applications hasn't been enforced yet and is unlikely to yield substantial revenues for the state. If the tax does yield substantial revenues for the state, it would have negative effects on the ICT sector, which is already suffering under the combination of poor economic climate and government intervention.